So, you’ve decided to dive head-first into the madness that is content creation, but you don’t know where to start? One of the hardest things about content creation is simply coming up with ideas for fantastic content that people will actually read. This is especially true of people who are in so-called “boring” industries. When working with companies in both the B2B and B2C space, our team has taken a number of different approaches to brainstorming helpful content. Then we were finally able to do it. We cracked the code on making content creation a breeze for marketers. The secret we found is to leverage buyer personas in every stage of the process. 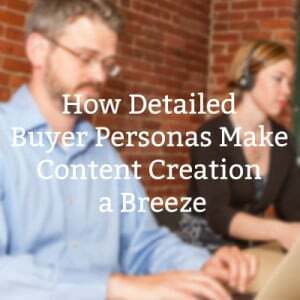 Here are ways that buyer personas will make your content creation process both easy and impactful. When I talk with a marketer who is getting ready to start blogging, one of the biggest concerns that they often share is what they are going to write about. After all, how much content can they actually create about their products without constantly repeating themselves? Before you put pen to paper and start outlining blog headlines, you need to think about your personas. What questions are those types of people asking? If you don’t know, ask your sales team for 10, 20, or 30 questions that are commonly asked by that kind of buyer. You may be surprised by the questions that frequently come up. With these questions in mind, create 1-3 blog headlines for each one, and write the post with the sole focus of helping your prospects. With examples of real life questions, challenges, objections, and pains in your back pocket, you can start writing confidently because you know that you are focused on helping people to solve real problems. For example: Let’s say that you have worked a lot with Rick, a maintenance manager at ABC Mining. When they first came to you they were struggling to find a solution that would help them to keep their equipment up and running smoothly. As it turns out, you find that this problem is common to many mine maintenance managers who you service around the globe. Addressing this pain in a series of blog posts will be easier with Rick in mind. You know his objections, and you know how to speak his language. Now, simply write the post like you are writing to Rick. This will give your post a narrative that is exceptionally valuable in creating a readable article. A lot of marketers today are excited about social media. Social media can be a great way to share your content and engage with your prospects, but it is also easy to over-commit in the wrong places. With your personas in mind, you can get a better idea of where your best prospects spend their time. Is it an industry group on LinkedIn, or do most of them spend their days on Twitter? By optimizing your efforts for where your prospects spend most of their time, you can maximize the impact of your social media and engagement efforts. The Content Branching System (CBS) is a fool-proof way to strategically plan and create phenomenal content. In an article on the HubSpot blog, Andrew Dymski describes the process of turning a single eBook into 4 months’ of lead generation content. Maximize your content creation potential with our Ultimate Guide to Epic Content for Boring Industries. Give it a download and be sure to let us know what you think!